For as long as I can remember, growing up in this game of golf, the apparel has always been a bit different than what we would normally wear in our every day lives going to work, dinner or other mundane tasks. One of the major differences has been footwear for the golf course and I am not speaking in general about the fact that most golf shoes have cleats for traction, but rather the style that went with them. Saddle shoes and classic wing tips have long been associated with golf footwear, and been a sharp and stylish look and something that differentiates the sport from other activities in one’s life. 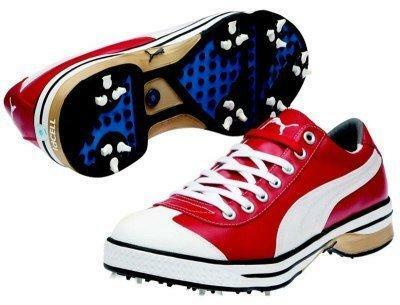 A few years back, the golf specific footwear started to come out in a few other styles and it was music to the ears of those that felt that certain looks remained stuffy rather than classic. Athletic (sneaker) style shoes became more prevalent as companies such as Nike and adidas Golf hit their strides in the footwear market and many flocked to the lighter weight and comfort that these offered. While they did not dominate or command the marketshare as much as classic styles did, they offered the golfer choices that for many years seemed impossible. Fast forward to a couple of years ago and a new generation of golf shoes seems to be hitting the market and the popularity is growing more by the day. This being that of the “casual” shoe or “hybrid” golf shoe in that many times it is spikeless (in the traditional sense) and can be worn from the course to the 19th hole and back again. The style of the shoe looks less like its for golf and more like it was made for day to day activities. Company after company is entering this market and it is only a matter of time before more golfers are flocking to the less than traditional look. Some would call this shoe the one that got it all started. Fred Couples wearing them at the Masters was all the talk and golfers everywhere were drawn to the unique look that they offered. Trying them on showed off their extreme comfort and the ability to wear them away from the course added to their appeal. 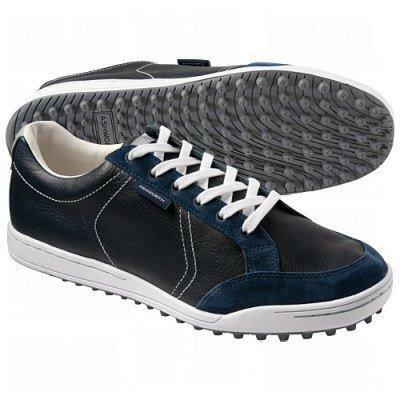 In 2011, ECCO released their latest version of the popular casual shoes and while the design changed slightly, the extreme comfort has not. 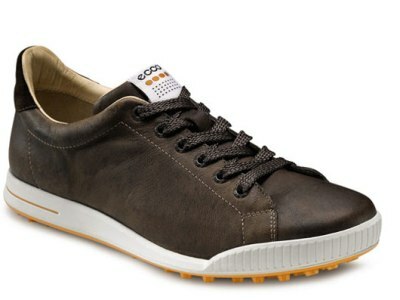 The 2011 Golf Street shoes feature incredibly soft uppers made of camel leather and a breathable liner to aid in comfort. During our testing we found the heel support that most are seeking absolutely wonderful in these shoes and the microfiber grip on the heel offered softness to avoid any slipping. Last year Nike Golf came out with the Anthem and they had a unique casual sneaker look to them and we liked them quite a bit. 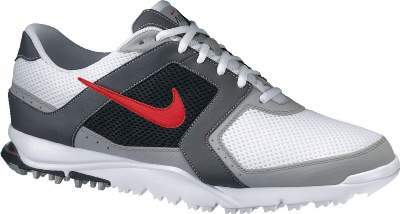 This year Nike Golf has a new line in this category made up of Air Rate and Air Range that are almost a hybrid of sorts between a casual shoe and athletic style footwear. The difference between the two appears to be waterproofing as the styles and looks are similar. In our testing, the shoes felt extremely light and almost breathable offering superior comfort throughout the heel and footbed. Both shoes feature a combination of built in traction as well as traditional spikes to provide stability in all conditions. Earlier this year at the PGA Show, THP got a sneak peek at the latest from Ashworth and we were pretty excited when we saw the new shoe line. One shoe in particular stood out that fits very well in this new category and that was the Cardiff. The shoe offers spikeless support and waterproofing on the technical side of things and then add to that a casual style made up of extremely soft leather with suede accents and you have a shoe that is perfect for the course and the restaurant following the round. During THP testing, we found that these shoes offered solid comfort and support that needed no break in time at all. Another shoe debuting at the 2011 PGA Show was PUMA Club 917 golf shoe and as soon as we took a look at them, we knew we had to have them. The Club 917 shows a hint of throwback to the Chuck Taylor shoes with all kinds of current technology thrown into the mix. They feature a style we would describe as casual athletic and have a combination of spikeless traction to go along with PUMA Smart Quill Technology. The shoes feature a synthetic upper that offers water resistance and a lightly padded collar and tongue for maximum support and comfort. In our testing we found the shoes to offer great stability and traction and a style that few companies are putting out. Long known for its classic and traditional styles, FootJoy has entered into this market as well with the launch of the new Street shoe. Chris Kirk wore them this past weekend when he picked up his first win on tour. A classic sneaker style shoe and another with throwback appeal to the Chuck Taylor athletic shoes from the past, the Street offers a casual shoe look without sacrificing any of the comfort or technology that many are accustomed to with FootJoy products. These shoes feature premium grade leather uppers and offer traditional spikes for maximum traction. In our testing, the FootJoy Street shoe was extremely comfortable and offered a completely different look than what we have come to expect from the company in the past. With so many companies coming out with these new styles, golfers everywhere have the ability to jump into a more casual shoe and find one that works perfectly for them. Let us know what is your favorite from the list and what your thoughts are on these new trends in footwear. Great write up JB – some very good looking shoes coming out! Best looking of this bunch have to be the Puma’s…gotta eventually get a pair. Thanks for that. You know, those Ashworth’s are really sharp. I never put a ton of interest in them until now. It’s amazing how much the golf shoe has transformed over what seems to be a very short time and I for one love it. As a consumer I now have a choice of traditional or pretty casual to cover the type of environment I find myself and just about everything in between. However, I would love to see one of our fabulous testers do a golf shoe shoot-out with these latest and greatest offerings, ranking these in comfort, traction, durability. Interesting stuff. I like the new nikes! I really love this movement in golf shoe styling. Great summary of the choices that are available at the moment, Josh. Great job JB. Love the new styles coming. 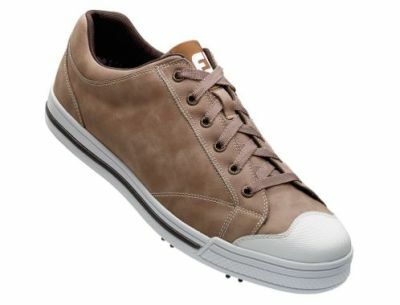 I’m currently waiting for my Ashworth Cardiff Golf Shoes pictured above to come. Excellent article JB. I like where the trend is shoes is going and it’s good to see a number of choices now. I have the Eccos that I still love but the Ashworth Cardiff and Nike Air Rate shoes are really something! Just the The Dude’s rug, shoes can tie an outfit together. Having so many options is a great thing. Well done, maybe I’ll do a casual golf shoe test as requested. Great write up JB, the hybrid/spikless shoes are something that I have been wanting to check out for a while now. It is funny how the golf shoe industry now follows ‘trends.’ Ashworth was my favorite based on looks. Thank you for the write up. Huge fan of the foot joy street. I’m a huge fan of the Nike Air Range and the Puma. Though the Puma may look somewhat like a bowling shoe, I LOVE how unique it is and would game them in a heartbeat! Great article JB. I was just looking at shoes today too… ironic! Good review JB. Interesting styles. I have several pairs of traditional shoes, but nothing like JB’s collection! I have never ordered from kikkor.com, but I recently found the site and really like their white tenny golf shoes. Not a huge fan of some of the ot thxher designs, but perfectly in line with this article. Good read. I like the Nikes and maybe they Pumas. The others just don’t do it for me looks wise. I think the biggest shift in golf shoes is the best golf shoes I have ever tried, the Tours and the Stealths from True Linkswear. http://www.TrueLinkswear.com. Try them and you will never go back to soft spiked golf shoes, especially if you like to walk the golf course instead of riding. THP reviewed the True Linkswear shoes already. Not sure our take agrees with yours, but glad you found a brand that works best for you. I got the Ecco’s and they are every bit as comfortable as the marketing hype says they are……I sometimes play 36 on Saturday and my feet feel great. I’m a big fan of the Ecco Streets. Though the Ashworth’s look interesting. Enjoy the enthusiasm for the street shoes, but must be generational. The styles look appropriate for skateboarding, not golf IMO…A couple look ok, but call me old fashioned. Part of the respect for the game is looking respectable on the course. No hats on backwards, T-shirts etc. These styles look better suited for hanging out in McDonalds parking lot. Wow, the Chuck Taylor inspired “look” is both inspired and really cool, especially for a Boomer who actually wore the originals to the local muni course as kid before I could afford real golf shoes! I saw the new FootJoy’s at Golf Galaxy this past weekend, and am sorely tempted to buy them. THP needs to do a shootout of how these new shoes perform in real golf conditions. If they meet our needs for breathability, comfort, waterproofness and most importantly foot support, I am sold..!!! Great write up. I have been wearing this type of shoe for over a year now and love them. I wear my Eccos everywhere. I now have some of the Ashworth’s as well. I have no problem slipping and they are very comfprtable. After seeing some of the new styles posted – the “dynamic” shift is a very precise description. More of these styles are slowly growing on me! I like the idea, but so many of the styles are hit and miss with me. the ECCOs are at top of my list, the Nikes are neat too. Somehow the Pumas look weird. Interesting styles. I’m too old for them. Tried both the FootJoy and Ashworth on today at Golfsmith. The Ashworth are much more comfortable therefore I ended up buying them. I’m looking forward to wearing them out on the course this weekend. I think traditionalists need to open your minds a bit. Everybody has their own style and comfort should be key while you’re playing, especially if you’re walking. So, if you don’t like them, stick to your old shoes. I’m trying these out in a couple of days and based on how they felt in the store, I’m not going back!